Much digital ink has been spilled over the last few years over Marvel’s push for more diversity in its character library, with many readers cheerfully yelling “It’s about time!” as the House of Ideas finally debuted (and put their marketing muscle behind) new characters like Kamala Khan and Miles Morales while others jeered as the company switched the race or gender behind the mask of classic characters like Thor, Captain America, and Wolverine. 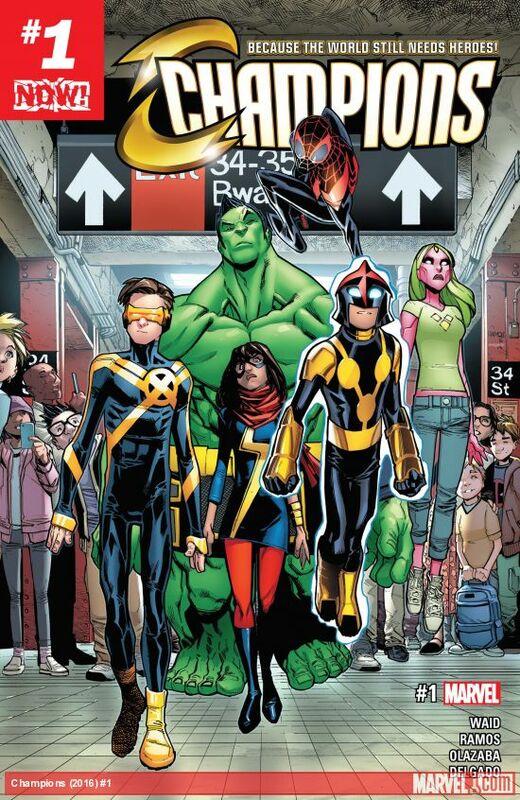 Fans in the latter camp would probably find much to grouse about in the lineup of Champions, Marvel’s newest teen team, which features a number of young, new heroes who use familiar names: Kamala Khan, the new Ms. Marvel; Amadeus Cho, the teen genius turned Hulk; Miles Morales, the formerly “Ultimate” Spider-Man; Sam Alexander, the brash new Nova; Viv Vision, the “daughter” of synthezoid hero the Vision; and Scott Summers, the time-displaced young Cyclops from the pages of All-New X-Men. From there, the team sets out to put the “warrior” in Social Justice Warrior, battling religious militants who are preventing the education of girls, racist Southern sheriffs, human traffickers, and a team of corporate mercenaries called the Freelancers whose main goal in life is to take jobs that let them “punch down.” Along the way, they get dragged into Secret Empire, face off against classic Marvel villains like Psycho Man and the High Evolutionary, team up (slightly unwillingly) with the Avengers, and even find time for the occasional karaoke night and paintball game. It can’t be all serious all the time; they are still teenagers, after all. 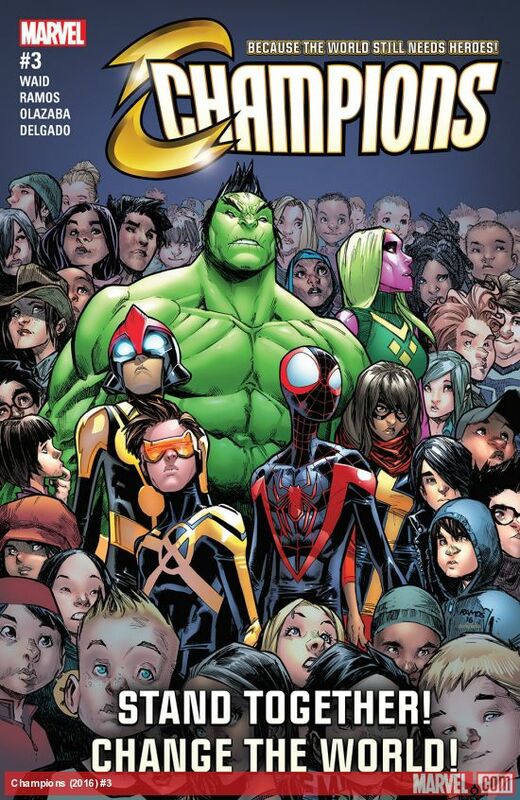 Marvel once prided itself on its stories featuring “the world outside your window,” and Champions does that saying proud by being the first superhero comic to really speak to today’s politically active teenagers. While his liberal bona fides would never be questioned by anyone who has read his Twitter feed, fifty-six-year-old Mark Waid may still seem like an odd choice to speak to the kids, but he does a phenomenal job of weaving Millennial progressive politics believably into the story. The characters may go off on the occasional monologue, but it’s character-based and believable, not ham-fisted or tacked on. In pretty much every way, this is a story very much of this moment; these teens speak in modern slang without it seeming hokey or forced, social media is a central component in a realistic (rather than perfunctory) way, and the kids even deal with modern problems like establishing an online movement only to see it coopted out from under them by sinister forces. It’s also, y’know, a superhero comic, so there’s plenty of action, interpersonal drama, and killer cliffhangers to keep you coming back month after month. One curious artistic choice the book makes, however, is wasted space: every issue opens with a wordless splash page, not to kick the story off but rather to make veiled reference to a plot point later on in the issue. Like most Marvel books, each issue of Champions runs a scant 20 pages of actual story and art at a $3.99 asking price, so giving one of those pages (5% of what you’ve got!) over to something that doesn’t really add to the story (seriously, one of them is just a drawing of a lamp) seems an odd choice; 17 issues in, that’s almost an entire issue’s worth of story we’ve missed out on. Which is a shame because, for all the things this series does right, it’s missing something major it could have used that space for: deeper character development. 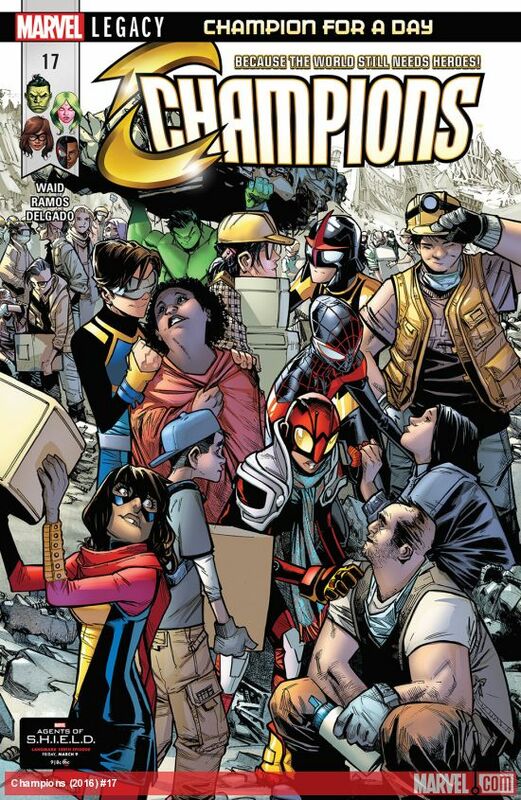 There are a lot of interesting bits of teambuilding and friendship building in this series, including an ingenious bit in the second issue where the Champions go on a camping trip to get to know each other better and start by teaching each other what their powers are, a great introduction or refresher for the reader that doesn’t feel like exposition in the slightest. But what’s missing is soap opera and side stories, things that develop the characters outside of the group dynamic. On one hand, it feels a bit superfluous to give these characters a solo spotlight in their team book when most of them have their own solo titles. But on the other hand, reading Champions by itself divorced from the solo titles, the characters can feel just a bit more like plot devices and a bit less like humans. Ironically, the nonhuman among the group gets the most development, with the last several issues of this particular run featuring a side story starring Viv Vision, exploring the strained relationship she has with her father and the fallout of (mild spoilers!) the High Evolutionary turning her into a real human. 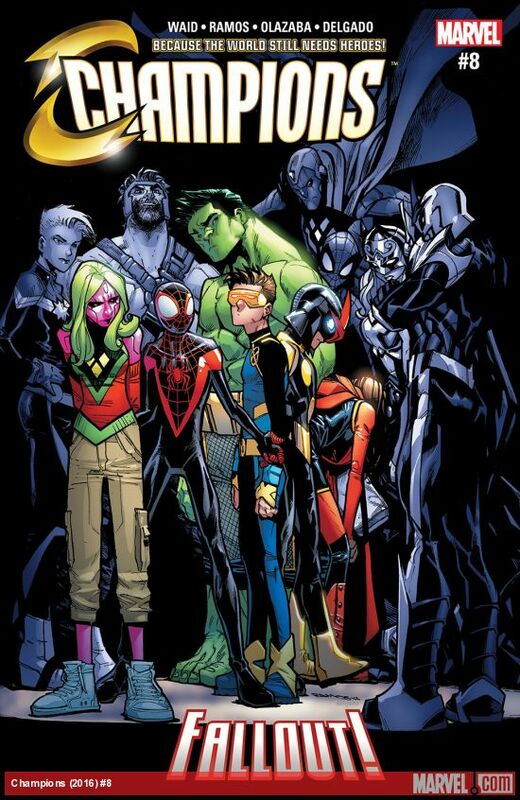 The addition of a more personal side story wonderfully rounded out the Champions reading experience, so hopefully that element is amplified even more as time goes on.